BHB is conveniently located half way between the city of Ellsworth and the town of Bar Harbor. With over 10,000 feet of shorefront and the prominence of Cadillac Mountain in the background, the airport offers spectacular views. The recreational possibilities within a short distance of the airport at Acadia National Park are almost unlimited. 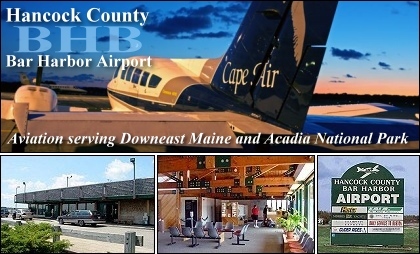 An instrument landing system and a full service FBO combine to make Hancock County-Bar Harbor Airport a safe and enjoyable year-round airport for the airline passenger, general aviation pilot, private charter passenger and everything in between.